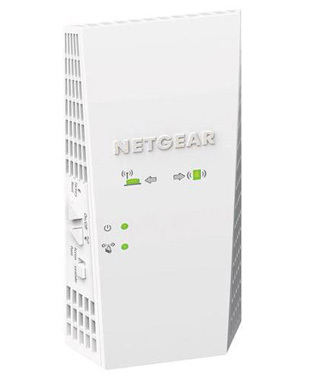 NETGEAR AC1900 WiFi Range Extender Essentials Edition boosts your existing network range, delivering AC dual band WiFi up to 1900 Mbps. It works with any standard WiFi router & is ideal for HD video streaming & gaming. Get the connectivity you need for iPads, smartphones, laptops & more. Boost your existing network range, delivering dual band WiFi up to 1.9Gbps. It works with any standard WiFi router and is ideal for HD video streaming and gaming with one Gigabit Ethernet port. The compact wall-plug design allows you to simply plug your AC1900 WiFi Range Extender Essentials Edition into any electrical outlet, and smart LED indicator lights help you place it for optimal boost in range and performance. WiFi Range Extenders boost your existing WiFi and deliver greater wireless speed and coverage to where WiFi signals are weak. Improve your home’s WiFi and get better connections for your iPads®, smartphones, laptops and more. With all the mobile devices in your home, you want the freedom to move around without worrying about your WiFi connection. The AC1900 WiFi Range Extender Essentials Edition helps to extend WiFi coverage throughout large homes and even backyards. Experience what it means to be truly mobile! With a Gigabit Ethernet port that acts as a WiFi bridge, the AC1900 WiFi Range Extender Essentials Edition is also ideal for connecting devices like gaming consoles, smart TVs and streaming players to your WiFi network, upgrading all of your entertainment devices to 11AC speed in a single shot. Improve the range of your existing WiFi network. Extend 2.4 & 5GHz WiFi up to 1900 Mbps & reduce interference. Push ‘N’ Connect using Wi-Fi Protected Setup (WPS) connects computers and/or routers to the Extender quickly and securely. WiFi Range Extenders boost your existing WiFi & deliver greater wireless speed & coverage to where WiFi signals are weak. Improve your home’s WiFi and get better connections for iPads®, smartphones, laptops & more. † Works with devices supporting Wi-Fi Protected Setup (WPS). Data throughput, signal range, and wireless coverage per sq. ft. are not guaranteed and may vary due to differences in operating environments of wireless networks, including without limitation building materials and wireless interference. Specifications are subject to change without notice. The product may not be compatible with routers or gateways with firmware that has been altered, is based on open source programs, or is non-standard or outdated. 1 Works with devices supporting Wi-Fi Protected Setup (WPS). 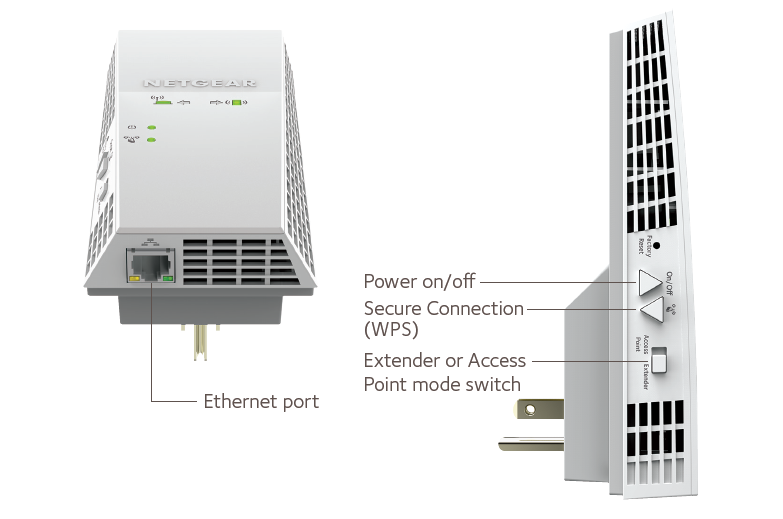 Download the NETGEAR EX6400 Datasheet (PDF).